Home » Editor's Choice » Three to Get Ready: Leopard Geckos! Three to Get Ready: Leopard Geckos! The Reptile Report - Eublepharis macularius, commonly known as leopard geckos are one of the classic “starter geckos”. How many of us kept leopard geckos as our first reptile? How many of us have “moved on” to more challenging species? For some of us, though, leopard geckos remain our passion and prime interest. This month you will hear from three reptile keepers who have maintained their fascination with leopard geckos throughout the years. Hear from gecko experts Marcia McGuiness, Thad Unkefer and Aliza Arzt after the jump! Geckos Unlimited - Users discuss an article written by a reptile veterinarian about vitamin A deficiency in leopard geckos. 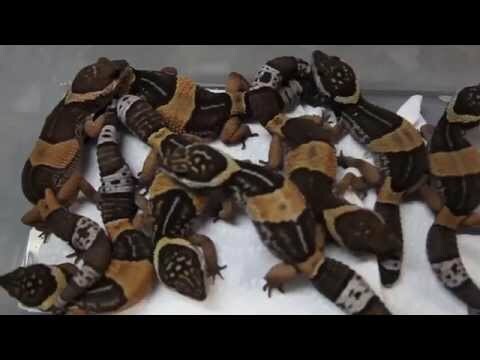 GeckoForums.net - See the many gorgeous leopard geckos that The Gecko Shop has produced this year.